A Chinook helicopter empties its bucket of water Saturday on the 416 Fire north of Durango. The fire was 1,974 acres in size and 10 percent contained Saturday evening. 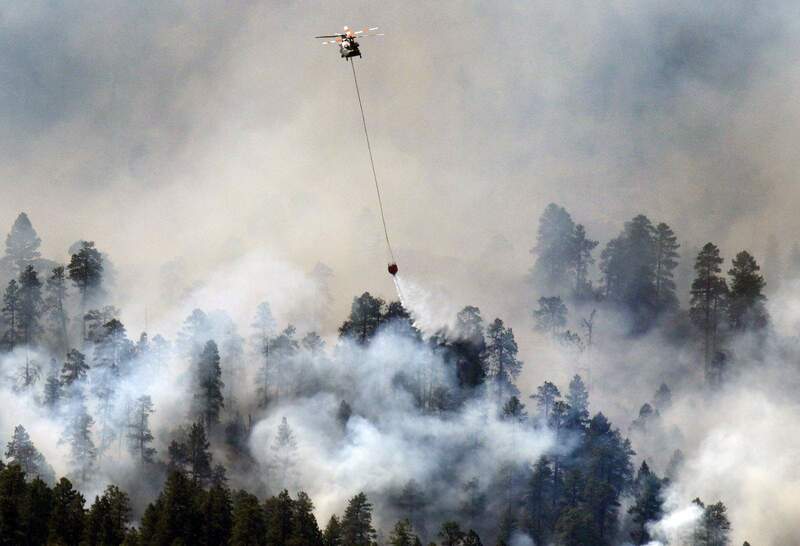 Federal firefighters put on an air show Saturday, using helicopters and air tankers to keep the 416 Fire from crossing U.S. Highway 550 north of Durango and achieving 10 percent containment on the 2-day-old fire. The fire grew from about 1,100 acres Friday night to 1,974 acres by end of the day Saturday. The 10 percent containment occurred on the southwest perimeter near the Mitchell Lakes area. Evacuation and pre-evacuation notices remained in effect and unchanged Saturday. About 825 homes are evacuated and 760 homes are on pre-evacuation notice. There was no time estimate for when residents might be able to return home, said Megan Graham, spokeswoman for La Plata County. Efforts Sunday will focus on keeping the fire on the west side of Highway 550, where a large majority of evacuated homes are located, and to seal off the bottom end of the fire so that it won’t progress further south, he said. A Type III federal interagency team, which has been in command of the fire since Friday evening, will hand off control to a Type II incident team at 6 a.m. Sunday, Mackensen said. A Type II team is able to summon greater resources and has a more robust command staff than a Type III team. The team will continue to rely heavily on an air attack to battle the blaze, Mackensen said. “We’ll still be using the heck out of them to buy us time, knock down hot spots, and to try and keep this thing going in the direction that we want it to go to,” he said. The northern and western edges of the fire will be problematic for firefighters to contain, Mackensen said. Local crews will continue to provide structure protection in subdivisions on the east side of Highway 550 and keep the fire from jumping the highway. No spot fires jumped the highway Saturday. On Friday, five spot fires jumped the highway but were successfully extinguished by grounds crews. About 250 firefighters worked the fire Saturday, Mackensen said. No injuries or accidents have been reported. Weather conditions aided firefighting efforts Saturday. Winds stayed between 3 and 5 mph for most of the day, a marked difference from the 30 mph wind guests crews contended with on Friday. Firefighting efforts were expected to last until about 9 p.m. Saturday night. “Usually around then, the fire behavior starts to moderate,” Mackensen said. Firefighting engines were assigned to patrol Highway 550 throughout the night to ensure spot fires don’t cross the road, Mackensen said. Hundreds of residents were given short notice to evacuate Friday as the fire advanced north in the Animas Valley near Shalona Hill. Mackensen said the team has had brief conversations about holding a community meeting to update residents, but no such meeting had been planned as of Saturday night. “I’m sure we’ll have a community meeting in the near future,” he said. The Durango & Silverton Narrow Gauge Railroad suspended all coal-fired steam passenger service through at least June 10 as a precautionary method. All guests of the train will receive full refunds. U.S. Highway 550 remained closed in both directions, with no estimation for reopening, Graham said. Drivers in Durango who need to go to Silverton must take a 177-mile detour over Lizard Head Pass. County Road 250 north of Baker’s Bridge is open to local traffic only in both directions. The fire started around 10 a.m. Friday. The cause remained under investigation. La Plata County is under Stage 2 fire restrictions, which means no campfires, even in developed campgrounds. A “state of local disaster” was declared Friday evening by La Plata County. The declaration means the county can access additional funds and resources from the county’s payroll to cover costs of operation during the disaster, Graham said. Federal firefighters estimated cost of battling the blaze was $691,000 as of Saturday night, Mackensen said. Fire crews are hoping favorable weather conditions will continue to aid them. There’s a 40 percent chance for rain Sunday afternoon, and winds of 10-15 mph with gusts that could reach 20-25 mph, said Jimmy Fowler, with the National Weather Service in Grand Junction. Graham said despite the low containment number, crews had a successful day Saturday battling the blaze. The 416 Fire on Saturday The 416 Fire continues to burn on Saturday but not with the intensity it did the day before. The 416 Fire continues to burn on Saturday but not with the intensity it did the day before.